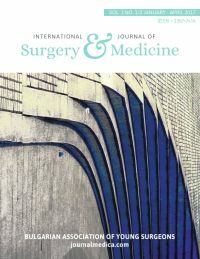 International Journal of Surgery and Medicine (IJSM) is an official journal of the Bulgarian Association of Young Surgeons (BAYS). It is an open access, international, double-blinded peer-reviewed surgical and medical journal that publishes original articles, reviews, case reports and short communications on all aspects of surgery and medicine in English. IJSM is published quarterly. Please read the guidelines below then visit the Journal’s submission site https://www.ejmanager.com/my/ijsm/ to upload your manuscript. Please note that manuscripts not conforming to these guidelines may be returned. Only manuscripts of sufficient quality that meet the aims and scope of International Journal of Surgery and Medicine will be reviewed. Manuscripts are accepted for consideration with the understanding that they have been submitted solely to International Journal of Surgery and Medicine (IJSM) and that they have not been previously published, either in whole or in part.